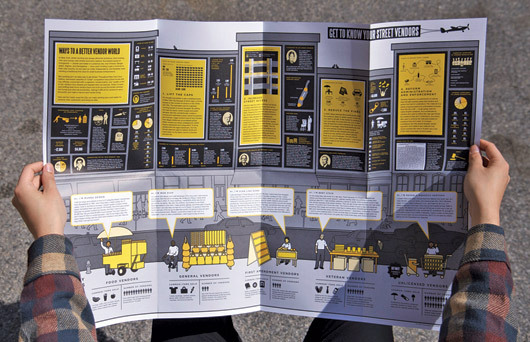 This is the second of two posts about design projects by Candy Chang; here's the first. 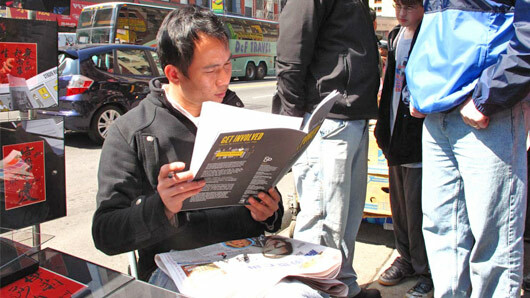 This one features a detailed poster and booklet about street vendor's rights in New York City. 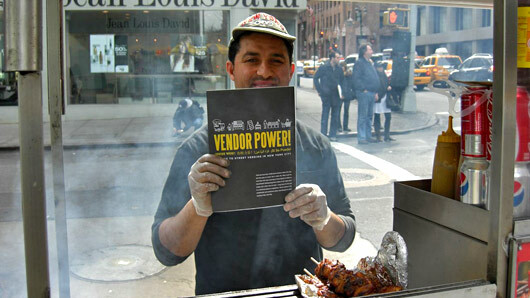 In Chang's own words, "The guide also serves as an educational/advocacy tool and includes a poster full of fun facts on the history and challenges of NYC street vending, personal vendor stories, and policy reform recommendations." 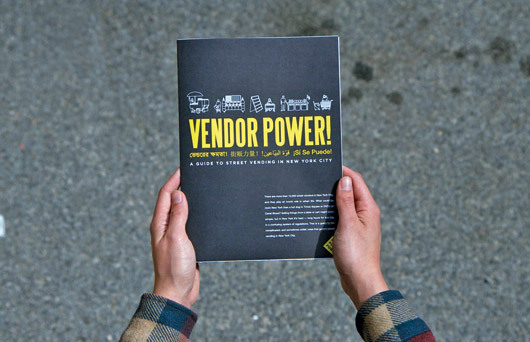 As part of Making Policy Public, Candy collaborated with The Street Vendor Project and the Center for Urban Pedagogy (CUP) to research, compile, and design this guide to street vending in New York City. 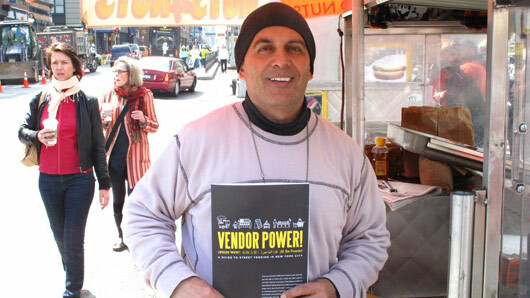 Many vendors are being fined $1000 for little things like parking their cart too far away from the curb, not “conspicuously” wearing their vending license, and other rules buried in the City's regulation book full of intimidating jargon that would make even the most patient person cry. 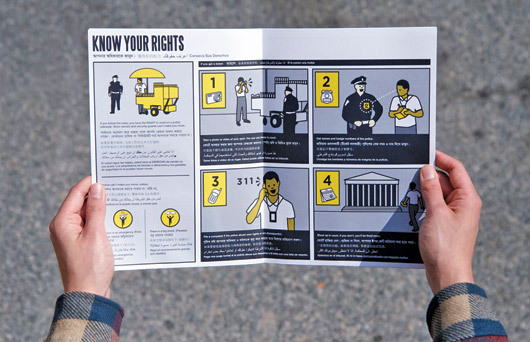 This guide helps clarify the rules through diagrams and minimal text in English, Bengali, Arabic, Chinese and Spanish, so NYC’s diverse vendors can understand their rights, avoid fines, and earn an honest living. Plus, this poster and its accompanying guidebook fall somewhere between grass-roots vendor-empowerment and straight-ahead small business advocacy; the fact that this applies specifically to mobile street businesses gives it an allure of the poetic, but it would be just as socially important if it outlined the legal dos and don'ts for family shops in the San Fernando Valley. 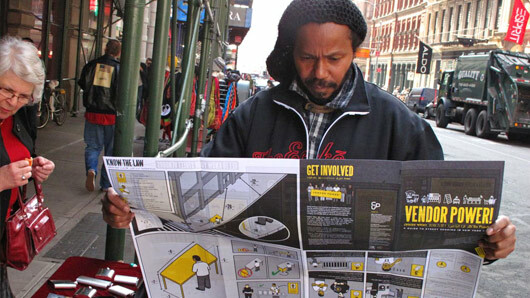 In fact, realizing that these sorts of posters could be made—similar to Chang's flashcard deck, as mentioned in the previous post—for other legal situations is like downing a quadruple espresso; how awesome would it be to design posters like this for urban agriculture, roof gardens, community parks, and more? Even suburban lemonade stands, for that matter. In any case, taken together, Chang's Vendor Power! 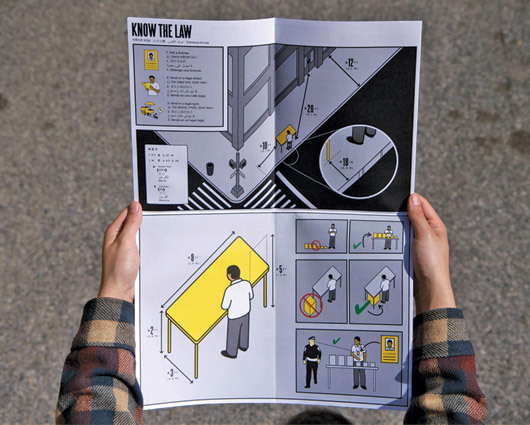 and Tenant Flash Cards projects offer two fantastic examples of how graphic design can be put to use in clarifying everyday, seemingly uninteresting legal situations—and I would love to see similar such endeavors occur elsewhere. The rights of the homeless in Los Angeles! Flashcards for international border crossers; your legal rights in quarantine; how to use the city in an electrical blackout. Or, for that matter, your rural hunting rights. Or the Geneva Convention! The rights of walkers in the British countryside. The possibilities are bewilderingly wide-ranging.